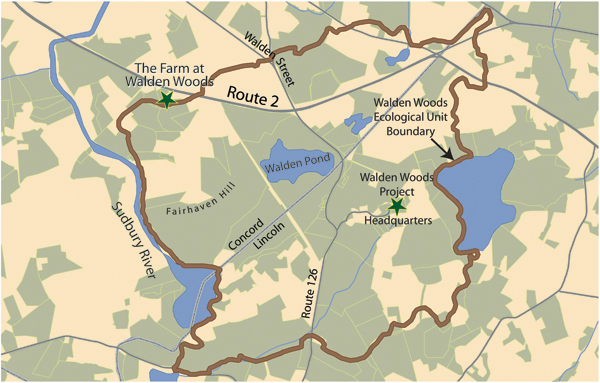 Located about 20 miles from Boston, Walden Woods is a distinctive area of glacial origin. It is the area that lay at the bottom of glacial Lake Sudbury, and is different from its surroundings because of the deep sand and gravel deposits that formed here. 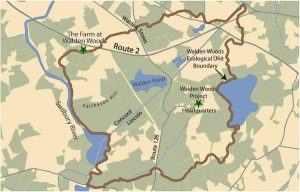 At the beginning of the American experience, Walden Woods was set aside as woodlots because of its poor quality soils. Throughout the colonial period, and right on into modern times, Walden Woods has been a marginalized landscape – held at an arm’s length from proper society. More than a century and a half ago, Henry David Thoreau wrote that “[e]ach town should have a park, or rather a primitive forest…where a stick should never be cut for fuel, a common possession for ever, for instruction and recreation.” (HDT Journal, 15 October 1859). It was Thoreau who inspired John Muir, Rachel Carson, Aldo Leopold, and generations of conservationists in the United States and around the world, to protect our natural treasures, and it was Walden Woods that inspired Thoreau. We work to preserve Walden Woods because of its worldwide literary, historical, and environmental significance, and to help inspire the next generation of environmental stewards. The Walden Woods Project recognizes the work of the late Dr. Edmund A. Schofield in documenting and promoting the existence of Walden Woods. An extensive documentation of the definition of the ecosystem can be read here. As Concord grew into a prominent and important town in colonial America, land was prized for its rich soils and the agriculture that was supported by them. However, throughout even the most intensive clearing for farming that peaked in the 1830s to 1850s, a large forest remained standing in the outskirts of Concord and Lincoln where Henry David Thoreau was able to conduct his famous experiment at Walden Pond. As the glaciers retreated northward around twelve thousand years ago, a huge glacial lake formed behind the trailing edge of the ice sheet, over what is now Walden Woods. Melt water drained into the glacial lake for millennia, dropping sand, gravel, cobbles, and boulders in deposits that are as deep as 50 to 60 feet. 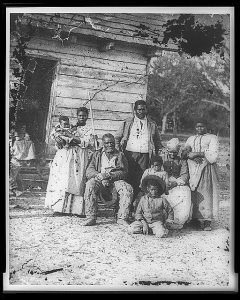 The sandy, droughty soils were very poor for farming, and the forest that grew over those deposits remained standing as a source of fuel wood and building materials, but it remained forested. The lack of productive soils in Walden Woods meant that the land there was not highly valued. Walden Woods became a marginalized landscape where people and activities that didn’t fit within the proper society of Concord were pushed. Itinerant laborers, freed slaves, and other marginalized people lived in Walden Woods. Henry David Thoreau spent much of his life walking through the woods and fields of Concord – especially Walden Woods – and the surrounding towns. His habits of observation and journaling led to some of the most profound revelations and ideas about conservation and preservation of our common inheritance – the land, its forests, plants and animals, and its very wildness. Thoreau’s essays inspired John Muir’s work to convince President Roosevelt to establish the National Park System; they were a foundation of Aldo Leopold’s belief that conservation of land is an extension of ethics; they established the base for modern environmental stewardship.